I got the notification on a customer’s controller. As you can see in the screenshot, the schedule continued. It also ran again this morning with no fault indication. Thanks for reporting this. I will have the engineering team review the details and determine what happened in this scenario. It happened again yesterday morning. Customer says the system has been running. Thanks @Sprinklerman, the team is still reviewing the issue. Thanks for reporting! I went to this controller’s property today for a check up. It turns out the master valve wasn’t the issue. It was a drip zone valve that had the faulty solenoid. Why would it tell me the master valve when it was a zone valve? Interesting, I’ll provide this data to the engineering team and let you know what their thoughts are. I had the team do some testing with the zone and master valve fault notification and it seems to be working correctly. A simple test is to put a wire between the zone and common, or master and common, and then run a schedule through the app or just use the buttons on the controller. You should see the controller power cycle and then receive a email and push notification. I can’t really explain the false positive you received earlier. Could be a power surge or something similar. If you see other odd behavior please just let us know and we can investigate further. I had some thoughts yesterday as I was heading to my first service call. The valve with the faulted solenoid is the first valve to run on the schedule and it was not detected as the fault. So, I am wondering what happens first to the master valve if the schedule is about to run? When does the fault detection kick in? Does the master valve get activated first, then the first valve, or do they activate at the same time? If they activated at the same time or very close, I could see this type of scenario where the master valve may be seen as the faulted solenoid when the first valve solenoid is the actual fault. If that is the case, maybe a delay between the master valve and the next zone would solve the conflict. This applies to a Gen2. When does the fault detection kick in? The fault detection is ALWAYS on. It works by looking for a disruption in the power supply to the Controller (the actual event, if you want to Google it, is called a brownout). When the Controller detects a brownout it saves off the state of which valves were active when the brownout occured and resets. 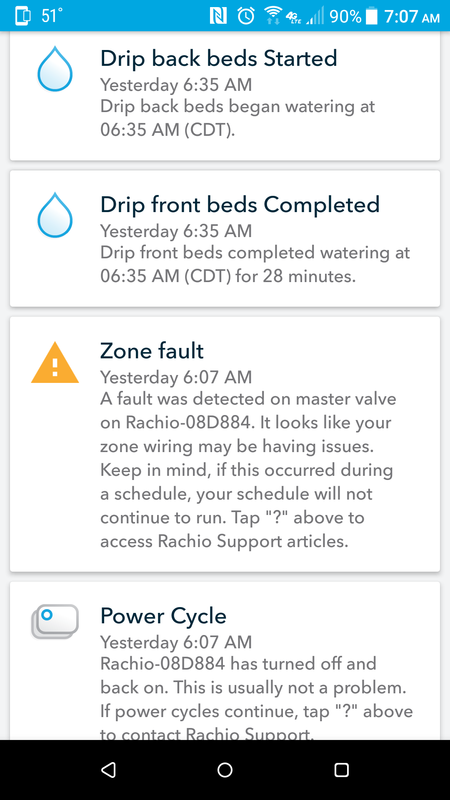 The reset turns off all the valves and when the Controller has reconnected to the Cloud it sends out a message indicating a fault occured, and which valves were active when the fault occured. 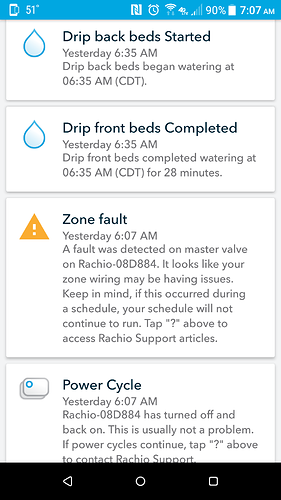 The actual message is formatted so that the Master Valve fault, and up to two Zone faults, can be indicated at once. Two Zones can be active at the same time due to Water Hammer. If they activated at the same time or very close, I could see this type of scenario where the master valve may be seen as the faulted solenoid when the first valve solenoid is the actual fault. If that is the case, maybe a delay between the master valve and the next zone would solve the conflict. 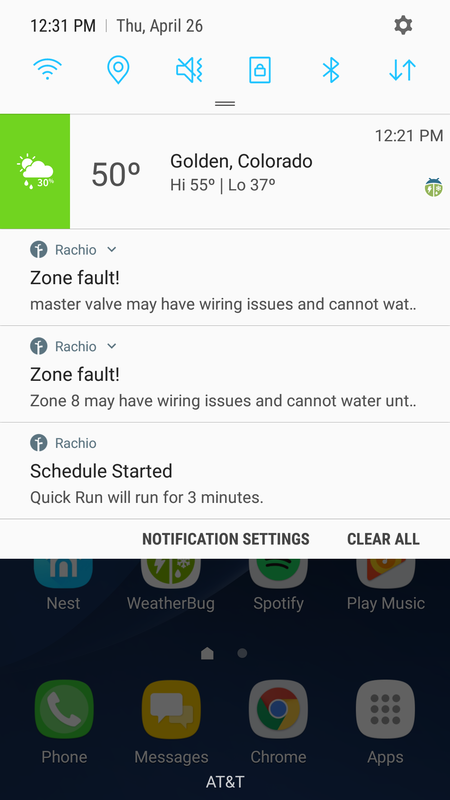 There is already a delay, but you would still see the issue where multiple valves have indicated a fault, but only one is actually faulting. In my experience looking at the logs, many peoples faults aren’t dead shorts from the Zone Port to Common which would caues a brownout almost instantly. It can be almost 2-3 seconds later before the fault actually occurs, at which point all Zones are “active” from the Controller perspective. 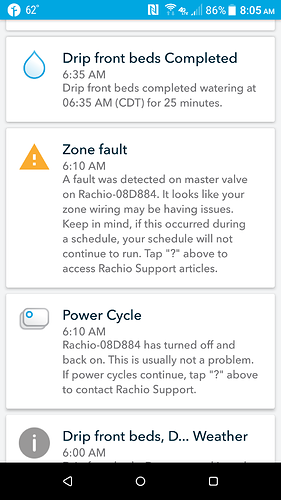 Thus when the message comes out it would indicate faults on multiple valves. The Controller doesn’t have anyway to distinguish which valve actually caused the fault. I’m also looking at making the brownout event messaging a little better. You are right about a fault not happening immediately. Sometimes it does delay, even on a standard controller with fault detection. If the fault detection is always on, when it detects a brownout it logs the fault, then resets. If there were five faults, would it then reset five times? The Controller doesn’t have anyway to distinguish which valve actually caused the fault. A smart controller should be able to distinguish specific valves. A standard controller with fault detection can! If that is the case, I think there should be a preload test through all the zones once a day before the schedule begins. This test could check for faults and open circuit tests on enabled zones.